Oil and Gas - Canada Forgings Inc. Forged Machinery used in the oil and gas industry are known to go through some of the harshest and demanding environments. That’s why it is important to have parts that can resist corrosion and cavitation as well as meet strict offshore gas and oil drilling requirements. CanForge has the tough and durable forgings needed to meet these essentials. 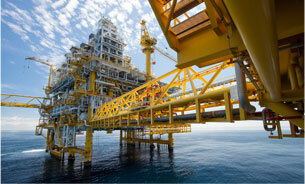 Products that feature a directional grain flow are suitable for the oil and gas industry. Because of this, forgings are sound and have remarkable mechanical properties. This type of grain flow also provides a longer service life and durability against impact. CanForge supplies forgings made out of many materials and grades to accommodate off-shore drilling purposes such as alloy, carbon, copper, stainless, nickel base, copper base, titanium, and aluminum. You may place orders that range from one piece to a high quantity of pump blocks, stabilizers, flanges, swivel rings, and custom shapes. Parts can weight anywhere from one pound to 80,000 pounds. Regardless of your needs, CanForge can help make your machinery last for years to come.